Millions Without Power After Storms, And Heat Promises To Sizzle : The Two-Way Friday's record-setting heat and brutal storms left much of the Midwest and Eastern U.S. cleaning up damage and waiting for crews to restore power on Saturday. More heat and more storms are on the way, too. 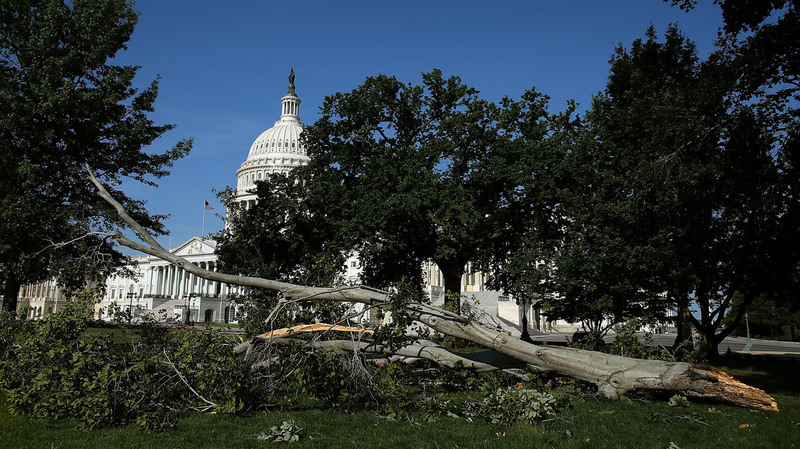 Branches and power lines littered the nation's capital after bruising storms swept through the Mid-Atlantic region on Friday night. Friday's record-setting heat and brutal storms left much of the Midwest and Eastern U.S. cleaning up damage and waiting for crews to restore power on Saturday. The AP reports 13 people dead and more than 3 million without power after a day where temperatures in cities from St. Louis to Washington, D.C., hit triple-digits. The misery's not letting up, however; the National Weather Service is predicting "another scorcher is in store for locations from the middle Mississippi Valley to the Mid-Atlantic Coast on Saturday." More storms are on the way tonight, too, it says. President Obama declared a state of emergency in West Virginia because of the damage caused by the storms. The declaration allows federal aid to supplement state and local response efforts. According to the state's website, the storms have "left an estimated 500,000 people without power as a result of outages in at least 27 counties." States of emergency were also declared in Maryland, Ohio, the District of Columbia and Virginia. President Obama called the governor of each of the states to get updates on the impact of the storms and express condolences for those who were killed. It could be days until power is restored hundreds of thousands of customers across the Mid-Atlantic. An alert from The District of Colombia's Homeland Security and Emergency Management Agency advises. "Critical customers who need electricity for life support equipment are advised to seek shelter where power is available. The weather forecast for the Washington area calls for more thunderstorms today, which could cause additional outages." "However, the magnitude of the storm was so large that it has left several utilities with millions of customers without electric service from the Midwest through the Mid-Atlantic regions." "We have restored service to approximately 90k of those impacted last night but we have a ways to go. We anticipate this will be a multi-day restoration and have asked for mutual assistance from other utilities." "Saturday brings a continued threat of severe weather at the northern edge of the heat wave, stretching from Iowa to the Mid-Atlantic. Another round of widespread damaging winds may materialize in these hard-hit areas. A second area of severe weather is possible for the central and northern Plains, but those storms may be more isolated in nature." Update at 5:05 a.m. ET. No Air Conditioning? "It remained uncertain when power would be restored, and it appeared that, on Saturday at least, many residents would face heat similar to Friday's without the benefit of air conditioning." The AP confirms an earlier report from the National Weather Service that a person has been killed in Virginia. Local police tell the AP that the woman died when a tree fell on her home in Fairfax County. Police are also responding to reports of other storm-related injuries. Storms pounded the Midwest and Eastern U.S. Friday night after a day of record-setting heat that's expected to continue through the weekend. Washington, D.C., Maryland, Virginia, West Virginia, Indiana and Ohio were pummeled. The National Weather Service has reported one death and three injuries in Virginia. Early Saturday morning, reports of heat-related deaths began to come in. The Associated Press says more than 2 million people have lost power. The Washington Post blogged about the damage in the D.C. area Friday night. The AP says the states were whipped with heavy winds, including a report of speeds of 75 mph in Maryland. Blaring heat fed the storms, CNN reports. "It's part of a massive system that has left one in three Americans baking in scorching heat and has threatened lives and doled out misery for those not fortunate enough to find a splash of cool water or air conditioning." CNN meteorologist Brandon Miller says about 100 million people across the central and eastern U.S. were affected by heat warnings, watches or advisories Friday.